On July 9, Antiquorum's sale will feature an impressive array of rare timepieces including a limited edition Concord C1 Quantum Gravity Tourbillon; a Franck Muller Calibre 97 Grande and Petit Sonnerie Minute Repeater; and a Chopard Imperiale Tourbillon Baguette Diamond Wristwatch. 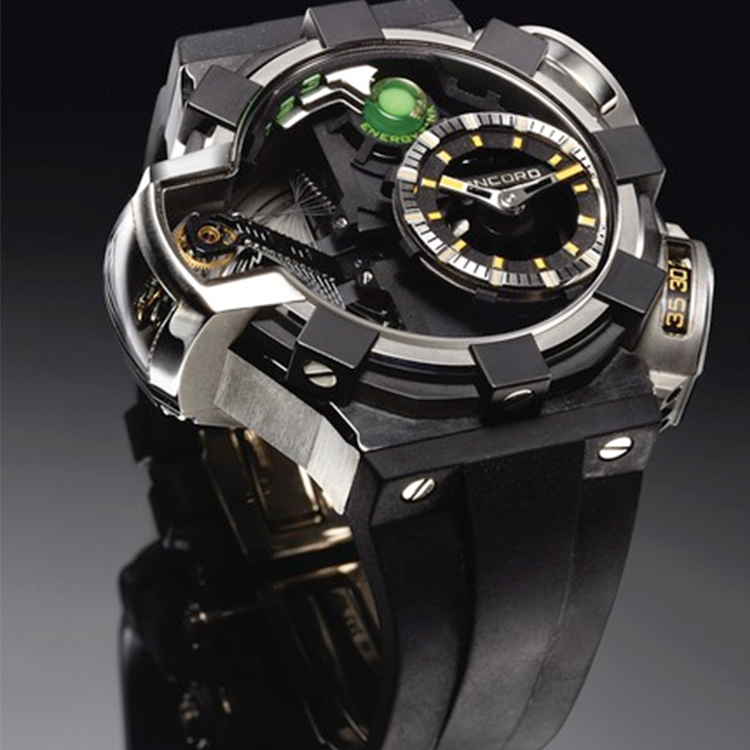 The Concord Quantum Gravity Bi-Axial Tourbillon, No. 08/10, is slated as the top lot for the sale. Announced at Basel Word in 2009, this is an extremely rare titanium and rubber bi-axial tourbillon wristwatch. One of the most visual and remarkable characteristics of the watch is the prominent green liquid of phosphorous nanoparticles that display the 3-day power reserve. The liquid, which rises and falls via a mechanical cylinder, glows in the dark when subject to light. At the time of its release in 2009, this highly desirable number 8 in the edition retailed for 500 000 Swiss Francs. A magnificent Chopard Ref. 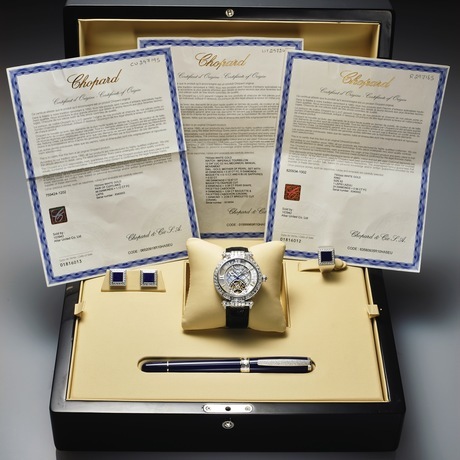 4250 Imperiale Tourbillon Baguette Diamond wristwatch in white gold with matching ring, cufflinks and ballpoint pen will also be going under the gavel. Produced circa 2010, this is a very rare 18K white gold baguette diamond chronometer wristwatch with visible one- minute tourbillon regulator and 8-day power reserve. Patek Philippe aficionados will, in no doubt, be placing their bets on the Patek Philippe Ref. 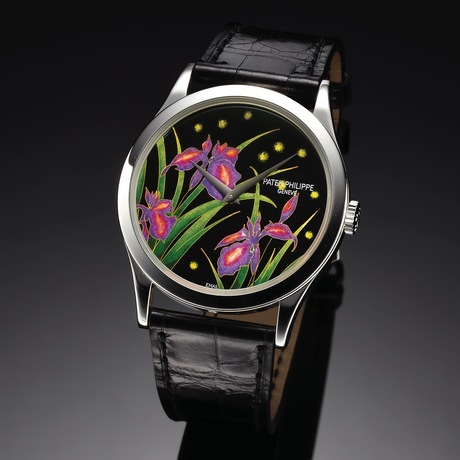 5077 Iris and Fireflies cloisonné enamel dial wristwatch. This is an exceptionally rare platinum wristwatch with an exquisite multi-colored cloisonné enamel dial depicting iris and fireflies at night. This outstanding timepiece was made in a limited production and sold on March 7, 2014.